When Adrienne McNay saw the opportunity to help children, she jumped at the chance. She planned on helping to run the daycare for younger children and researched activities and games the youth would enjoy. McNay and other students entertained the children with coloring, Halloween music, Styrofoam spider balls, a fake pond where they could fish for apples and horse races. 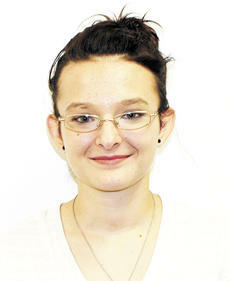 For her work and dedication, McNay was named the Youth Performance Award winner for September. McNay, a sophomore at Grant County High School, is the daughter of April Whalen of Sherman and Bobby McNay of Pendleton County. Her class schedule includes Spanish II, English II, Parenting, Child/Human Development, Intermediate Algebra, Biology and U.S. History. She lists her favorites as parenting or child/human development because she wants to get into the medical field and she believes those classes are helping her prepare for the future. Pat Conrad, McNay’s teacher for Parenting and Child/Human Development, nominated her for the award because of her enthusiasm for Hay Read and work ethic in class. Since she enjoyed participating in Hay Read, McNay plans on helping out with Operation:Imagination, a program for children in the Grant County school system where they have a book read to them and participate in other games and activities. After high school, McNay hopes to attend Northern Kentucky University with the plan to one day become a pediatrician.